Since Pages for Children will be giving away books and cards, we would like to have book reviews on this site. If you have read any books that you would like to share with us, please email the information to us. We will post it under your name. There are a few stipulations though. There cannot be any inappropriate language or scenes it will be taken out. Please remember this site if for children and if we do not feel that children should be reading it, we will change it to where they can. If you're wondering why we're asking for your help in posting reviews the answer is very simple. We understand that not everyone enjoys the same kind of book so to have a variety of different book reviews on here, we thought we'd ask you to give us some. Everyone that works for Pages for Children is a big advocate for reading and we feel that this way, maybe, we can give others a different point of view on various kinds of books. Reading is a great way to escape. While you may learn something you also get to stretch your mind. Most books are simply the author's answer to a "What if" question that they have. For example, H. G. Wells wrote "What if man could travel through time? What would he find?" It's through science fiction that we have all of the technology that we enjoy today. If people hadn't written their opinion of the answers to the "What if" questions we might not have computers now. So please go out, read a book and tell us what you enjoyed about it. It will be posted on here. To start, I would like to tell you about the book "The Abyss" by Orson Scott Card. I'm sure that most of you have already seen the movie, but I have just finished the book as well. Usually, you watch a movie and then read the book and you will find them so different that it's almost like two different things. Not in this case. The book followed the movie so much that is was like watching the movie but with a narrator there telling you things that the movie couldn't show. Such as, Why was Coffey like he was? What caused Bud and Lindsay to get married in the first place? Why did Lindsay and Bud choose the careers that they did? Why were the NTI's so interested in us for? These are just a few of the questions that the book answers that the movie can't. The movie can't tell you what these people were thinking as they did something. It can't tell you that the NTI's were watching the crew or how they came to be able to communicate with us. An while I don't usually read the acknowledgements in a book, I did in this one. It was very interesting and informative. Even the ending surprised me some but I won't tell you what happened so maybe you'll read it yourself. I will say this, if you enjoyed the movie, you will probably enjoy the book. It might even make you enjoy the movie more. Good morning and a very cheery hello! Found your website just this morning and decided to share. 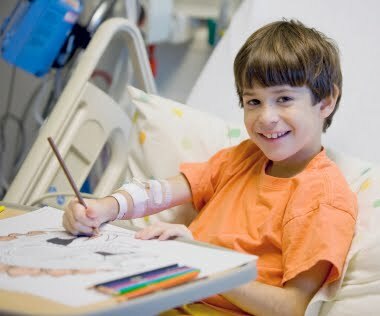 I love your mission of helping kids out during hospital stays. Books really can help, and in very special ways. My favorite book is The Alchemist by Paulo Coelho. Now translated into over 70 languages, The Alchemist is a magical fable that touches the hearts and imaginations of readers of all ages worldwide. We meet a boy named Santiago, who has a dream of travel and buried treasure. In deciding to follow his dream, life becomes an amazing, extraordinary adventure! He meets new friends, learns valuable life lessons - such as listening to his heart and following signs - along the way. This book has inspired and encouraged me in countless and immeasureable ways. A 'must read' for every dreamer.